I’m huge music fan, and it wasn’t long ago that everywhere I drove, I’d have the music blasting in the car. But now, I can’t remember the last time I listened to music in the car. What replaced the music? Podcasts. Listeners of a podcast in the last month have almost doubled since 2008 - 17% (up from 9%). One-third (33%) of all Americans 12 and older have listened to at least one podcast. Podcast awareness has more than double since 2006 - 49% (up from 22%). Publicly available data indicate a steady rise in number of active podcasts and number of download requests over the past three years. Mobile devices are the preferred way to listen to podcasts. Why the breakout popularity? One big reason is its accessibility. With smartphones, you can listen anywhere – in the car, exercising, just taking a walk, etc. Another reason is the variety in content. While shows like Serial, The Adam Carolla Show and WTF with Marc Maron have certainly moved the needle for awareness and listenership, you can find podcasts for just about any subject you want. As mentioned in the stats above, the number of podcasts continues to rise. Many thought leaders have started their own podcasts to share their expertise or comment on news in their industries. I’m constantly looking for the latest trends in marketing. While I still read my share of books and blog posts, podcasts have quickly grown to be one of the mediums I turn to most often to stay current on the latest news. Marketing podcasts launch quickly, and it’s hard to keep up with everything that’s out there. To help, Jay Baer (@jaybaer) and Convince & Convert (@convince) have created MarketingPodcasts.com, a free discovery engine for marketing podcasts. Through this site, search for podcasts (by name or host), read podcast reviews and sign up for notifications of new shows added to the database. While MarketingPodcasts.com is a great way to search for podcasts that may interest you, referrals are another. Similar to our post where we shared the blogs we read, below is a collection of marketing podcasts that we regularly listen to here at PR 20/20. PNR: This Old Marketing: Joe Pulizzi (@JoePulizzi) and Robert Rose (@Robert_Rose) discuss the week’s top content marketing articles, highlight their rants and raves and profile a weekly example of “This Old Marketing.” What makes this podcast stand out (beyond their marketing insights) is the chemistry between Pulizzi and Rose. 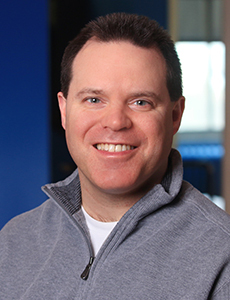 The Pivot: Marketing Backstories: Todd Wheatland (@ToddWheatland) explores the backstories of great marketers through engaging conversation. Claim Your Fame: Andrew Davis (@TPLDrew) profiles companies’ successes and shows you how to apply them to your company. Content Marketing Next: Pamela Muldoon (@pamelamuldoon) discusses marketing trends and what to expect in the future with marketing professionals. Content Inc.: Joe Pulizzi offers one quick lesson that you can apply to your business. Many of the takeaways are from his experience as an entrepreneur. Social Pros Podcast: Real People Doing Real Work in Social Media: Each week, Jay Baer and Jeff Rohrs (@jkrohrs) talk with social media professionals from a wide range of companies like Buzzsumo, WKYC, Cabela…just to name a few. Learn how they built their programs and how they continue to measure and improve. Content Pros Podcast: Amber Naslund (@AmberCadabra) and Chris Moody (@cnmoody) interview the top content marketers to learn their approach to strategy, operations and measurement. Convince & Convert Podcast: The best of the Convince & Convert blog posts are repurposed in podcast form and read by Jay Baer and others. Jay Today: The audio version of the Jay Today TV where Jay Baer offers three-minute commentaries on the marketing world. 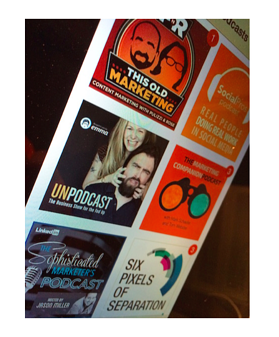 UnPodcast: The Business Podcast for the Fed-Up: Scott Stratten (@unmarketing) and Alison Kramer (@UnAlison) discuss how to succeed by showing us what NOT to do, as only they can. The Marketing Companion Podcast: Mark Schaefer (@markwschaefer) and Tom Webster (@Webby2001) deliver one of the smartest and most entertaining marketing podcasts available. The Sophisticated Marketer’s Podcast: Though it’s one of the newer podcasts with only four episodes so far (as of this writing), Jason Miller (@jasonmillerCA) hit the stage running with must-listen content that’s turned up to 11. Ask Gary Vee: Gary Vaynerchuk (@garyvee) answers your questions about marketing, social media and entrepreneurship. Marketing Smarts: This podcast by MarketingProfs (@MarketingProfs), hosted by Kerry O’Shea Gorgone (@KerryGorgone), features a variety of marketers and shares insights to make you smarter. The Growth Show: Hubspot (@Hubspot) CMO, Mike Volpe (@mvolpe), welcomes guests to talk about the growth of their company, idea, team, etc. and how they did it. Social Media Marketing Podcast: Michael Stelzner (@Michael_Stelzner) interviews guests each week to talk about what works in the world of social media. Louder than Words: John Bonini (@Bonini84) inspires your creativity by talking with successful guests that discuss their creative process. Marketing Over Coffee: John Wall (@JohnJWall) and Christopher Penn (@cspenn) record the show in a local coffee shop and discuss all things marketing. Six Pixels of Separation: Mitch Joel (@mitchjoel) offers his thought-provoking perspective on digital marketing through discussions with his guests. Freakonomics Radio: Like with their books, host Stephen J. Dubner and frequent guest, Steven D. Levitt explore the “hidden side of everything” and teach us to think differently. ConversionCast: Tim Paige (@TimThePaige) offers highly respected marketers who share one tactic that greatly increased their numbers with hard data.